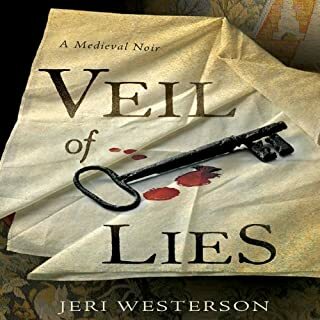 Although Jeri Westerson (in her afterwards) describes her book as Sam Spade meets 14th century, I was never as big of a Sam Spade fan as I was of Nero Wolfe. The book (and hopefully the series) is a great addition to the tough-guy adventure/mystery series like the two previously named. Westerson weaves historical incidents and personalities with the obsession with religious relics and a small pile of corpses. Fascinating and complex characters enhance the pot. Michael Page's narration brings the world of the poor of London to life with the blood violence and treachery you would expect. This is an amazing crossing of genres including a steam-punk mystery, dystopian future adventure, and alternative history. Hodder's is tightly and carefully woven to create suspense and action. Part way through, I feared that the plot had major holes i it and might not actually work out, but I was, thankfully, wrong. 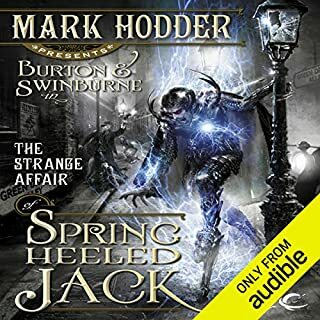 It was exciting that a major chunk of the end of the book, tells us the story not from the perspective of our main characters, Burton and Swinburn, but from Spring-Heeled Jack himself. This allows readers to see what misconceptions Burton made and how two different perspectives can give the reader a glimpse at the truth. Doyle is a fine narrator, although in his quest to differentiate characters voices, he sometimes lost the clarity and diction required for an audio book. 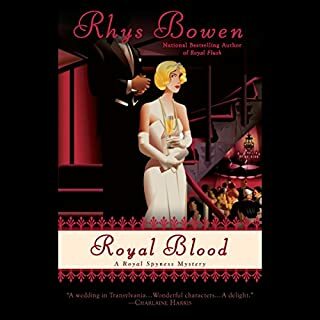 Rhys Bowen's installment of the Royal Spynness series has our spunky leading lady heading to the Transylvania to represent the Royal Family at a distant cousin's wedding. Bowen crafts a story of high adventure, intrigue, and comedy. A wonderful new addition to Bowen's cast of characters is a new maid of exactly the caliber the impoverished Lady can afford. I was also thrilled at the continuing romance between Georgie and her mysterious beaux. Katherine Kellgren makes Bowen's characters come to life with her wonderful narration. High school English teacher Skyler Foxe swears he's done being an amateur sleuth. Instead, he'd rather concentrate on his career as a teacher and on his hot boyfriend, head football coach Keith Fletcher, who is busy with football practice and an interesting new player that puts Keith in the spotlight for a change. But Skyler encounters a few homegrown surprises of his own, not the least of which is the unwelcome appearance of one of Keith's old flames. Where does Crazy Like a Foxe rank among all the audiobooks you’ve listened to so far? This whole series ranks among the top of my audio books. 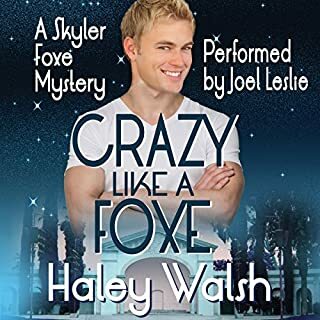 While "Crazy Like a Foxe" is not my favorite in the series, it is an excellent and worthy continuation. What was one of the most memorable moments of Crazy Like a Foxe? The most amazing writing in this book came as Skyler asked his friend Jamie to do something completely unethical. I was so drawn into the book, that I began yelling at my playback device trying to talk Skyler out of it. Walsh's characters are so fully developed that I feel as if I am catching up on friend's lives as I read the book. Beyond the fabulous writing, Leslie's narration was superbly paced building towards climax. I was on the edge of my seat. Like the rest of the series, there are many laugh-out-loud moments. Walsh's humor doesn't come from jokes and punch-lines, but from well drawn characters reacting to the situations in which they find themselves. The whole series is fantastic. I usually advocate for starting a few books into a series because many author's don't really find the perfect tone and voice until then. That is not the case for Skyler Foxe. Walsh hit the ground running, and the characters develop very nicely from book to book to book, that going backwards would, to my mind, hurt the enjoyment of the whole thing. (Plus later books are spoilers for the first three). Skyler Foxe is a high school English teacher, now out and proud. He's "Mr. Foxe" to his students, and just plain "Skyler" to his posse of friends and his boyfriend, high school football coach Keith Fletcher. In Foxe Den 2: Summer Vacation, Skyler and Keith offer a beach party for the Gay-Straight Alliance kids. Two gay teens have an intimate moment in their own story, Skyler's friend Mike de Guzman experiences Skyle's favorite gay bar, Trixx, and finally, Skyler and Keith go on a backpacking trip. I am a die-hard mystery fan, and I was a bit skeptical to see Foxe Den and Foxe Den 2 which don't have robberies and corpses. Crimelessness aside, I really enjoyed seeing the characters away from all that and living their normal lives. With the statement that they are not mysteries (like the rest of the series), I would recommend them to friends who have read at least one other Skyler Foxe mystery. What other book might you compare Foxe Den 2: Summer Vacation to and why? Probably Foxe Den 1, as it shows the mystery solving gang "off-duty" as it were. Leslie does a great job creating a unique voice for all the characters (even minor 1-line characters), so that it isn't hard to know who is speaking even in complicated dialogue sections. If you could take any character from Foxe Den 2: Summer Vacation out to dinner, who would it be and why? It would have to be Mike, but mostly because I think he still needs some assurance that his new group of friends are ok, and aren't out for him.